Have you always wanted to get up close to whales, dolphins and other sea creatures? Travelled hundreds of miles only to be disappointed? Then join us and discover the Yorkshire Coast’s biggest secret! BOOKING FOR TRIPS IN 2019 SEASON IS NOW OPEN! During July and August we offer two hour evening Coastal Cruises showcasing the stunning Yorkshire coast with a chance to see its amazing wildlife. We will be putting this cruise up for booking online so you can reserve a place but you may 'pay on the gate' if you prefer. The last week of September through to the first week of October is more suited to any dedicated wildlife enthusiasts wishing to maybe see the last of the whales as they migrate south or to catch glimpses of migrating birds crossing our path such as various wablers and songbirds, various shearwaters & skuas, honey buzzards, short eared owls..... Anything is possible at this time of year. 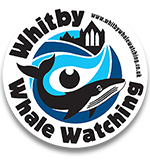 Please be aware dedicated whale watching is unsuitable for under 12s, children will not be permitted to board and no refund will be given! *Please note, all return times are approximate so ensure parking etc. allows for this. Parking can be difficult in Whitby so ensure you arrive early to allow for this. Please select a Month then click the date of your choice. Next select your trip time and places required. Then follow instructions to payment. Any problems please use the contact us form and we'll help. Note trips are of varying length and price, 4hrs-8hrs.